Amb V is an Ambrosia sp (ragweed) pollen allergen. 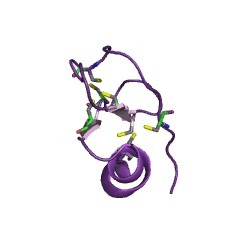 Amb t V has been shown to contain a C-terminal helix as the major T cell epitope. Free sulphhydryl groups also play a major role in the T cell recognition of cross-reactivity T cell epitopes within these related allergens. Amb V is an Ambrosia sp (ragweed) pollen allergen. Amb t V has been shown to contain a C-terminal helix as the major T cell epitope. Free sulphydryl groups also play a major role in the T cell recognition of cross-reactivity T cell epitopes within these related allergens [(PUBMED:7594515)]. There are 3 Amb_V_allergen domains in 3 proteins in SMART's nrdb database. Taxonomic distribution of proteins containing Amb_V_allergen domain. This tree includes only several representative species. The complete taxonomic breakdown of all proteins with Amb_V_allergen domain is also avaliable. Click on the protein counts, or double click on taxonomic names to display all proteins containing Amb_V_allergen domain in the selected taxonomic class. T cell epitope mapping of ragweed pollen allergen Ambrosia artemisiifolia (Amb a 5) and Ambrosia trifida (Amb t 5) and the role of free sulfhydryl groups in T cell recognition. Ambrosia artemisiifolia (Amb a 5; Ra5S) and Ambrosia trifida (Amb t 5; Ra5G) are homologous allergens purified from short and giant ragweed pollen, respectively. 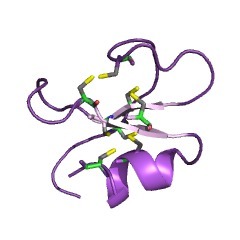 Allergic human sera and hyperimmunized animal antisera directed against Amb a 5 or Amb t 5 show a high degree of species specificity, with little or no cross-reactivity between these two allergens, suggesting that the major Ab binding epitopes of Amb a 5 and Amb t 5 are distinct. Overlapping synthetic peptides derived from the allergen sequences were used to investigate the specificity of T cell responses in four strains of mice, BALB/c (H-2d), CBA (H-2k), C57BL/6 (H-2b), and A/J (H-2a). All four strains of mice responded to purified Amb a 5 and Amb t 5. Cross-reactivity was found at the T cell level between Amb a 5 and Amb t 5 in T cells from BALB/c, A/J, and CBA mice, but not in T cells from C57BL/6 mice. A T cell epitope from Amb a 5, residues 27-36 (PWQVVCYESS), was mapped using T cell hybridomas from BALB/c mice. A T cell epitope in Amb t 5 was mapped in the same strain to residues 24-34 (KYCVCYDSKAI). Disulfide bonds in Amb a 5 and Amb t 5 were found to be involved in T cell reactivity. Conversion of disulfide bridges into free sulfhydryl (SH) forms was required for the response of T cell hybridomas to peptide t5 (residues 27-40) from Amb t 5. Reduction of peptide a4 (residues 21-37) from Amb a 5 was essential for inducing the cross-reactivity observed with Amb t 5-specific T cell hybridomas. It is concluded that free sulfhydryl groups play a major role in the T cell recognition of cross-reactivity T cell epitopes within these related allergens.